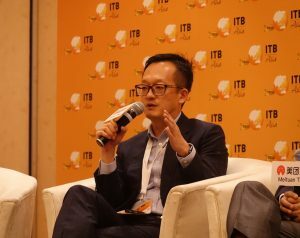 Yearth Alliance is proud to be part of the panelists who took part in ITB Asia 2017: Conference of TravelDaily China Session. Our CEO, Mr Joseph Xia, along with representatives from Hotelbeds, Maritim Hotels and Sabre Hospitality Solutions shared valuable insights on China’s unprecedented growth in the travel sector for the millennials and its importance to the world travel and tourism industry. Millennials generally refer to those born between 1981-1995. Chinese travelers holds one of the biggest share in the tourism industry and 60% of these travelers are millennials. The millennials prefer a more seamless experience, especially towards the hotel’s services. They place a heavier emphasis in the efficiency of the hotel services and are more willing to pay for a unique experience. Other than the traditional way of promoting their services, a one-stop holistic service like “E-Concierge” is the new and better way to engage millennial travelers. Hence, it is vital for hotels to differentiate themselves by sharing more than just what they can offer, but also telling a “story” of what makes them unique as compared to others. Being more tech-savvy, most of these millennials rely heavily on their digital devices. About 70% of the Chinese millennials use their mobile phones for booking and purchases, as compared to 28% in North America. Hotels should be focusing on digitising their non-room products and services thus driving their offline sales volumes to online volumes. The integration of technology to their products and services will help improve the overall staying experience of the guest. Utilising travel blogs, social media and influencers to promote the uniqueness of travel brands or hotels to the millennials can also be very effective. Most of the Chinese millennials tend to do their travel research from travel blogs, social media or through recommendations from friends. Getting in touch with the in-coming or current hotel guests is also vital in enhancing the overall staying experience. Providing real-time information to the guests via mobile devices can help bridge the guests to the hotel’s products and services thus allowing the guests to have a better understanding of what the hotel is offering. In summary, to capture the hearts of the millennials, hotels need to evolve their services towards a more personalized level. By having a better understanding on the needs of millennial guests, a better customer-based experience could be rendered, which will in turn leads to higher customer loyalty.